Adidas has tapped another big name for their Adidas Originals line. 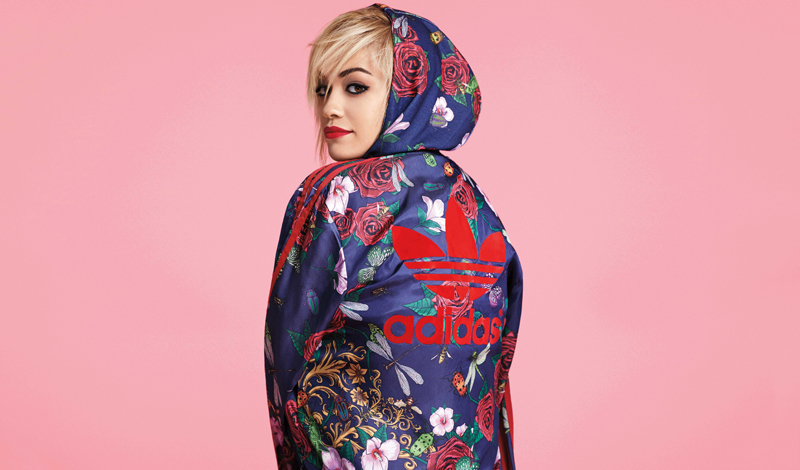 Rita Ora has been brought on board to do a three season collaboration under Rita Ora x Adidas that will debut with the Fall/Winter 2014 collection. Ora follows in the footsteps of recent artists and designers like Pharrell and Mary Katrantzou and ongoing collaborations with Raf Simons, Yohji Yamamoto, and Rick Owens. The 23-year-old chart-topping British singer has not only been making waves in the music scene, but has also been breaking out in the fashion world most recently, as the face of DKNY ad campaigns. The blonde haired, red-lipped singer’s looks and personal style have been gaining attention for some time; her latest project with Adidas will include apparel, footwear, outerwear, and accessories following in the vein of Ora’s own style and will range from $30 for a beanie to $500 for one of the brand’s iconic track jackets. If I’m not mistaken, Missy Elliott, who created a line with Adidas in 2004, is the first female artist to collaborate with the brand, not Rita Ora. As usual, Rita Ora’s importance as a cultural figure has been exaggerated once again.